It was the September smartphone event you haven’t been waiting for: LG’s new flagship phone, the Optimus G.
As expected, the electronics company showed off its latest Android-powered smartphone at a press event in New York today, a day after LG unveiled the phone in Korea. It might not be the new iPhone, but this is far from a budget phone. As my AllThingsD colleague Bonnie Cha writes, the 4G LTE, NFC-equipped phone is powered by Qualcomm’s quad-core Snapdragon S4 Pro processor, which promises speed, power and longer battery life. It has a 4.7-inch, 1,280 by 768-pixel HD touchscreen, a 13-megapixel camera on the back, and a front-facing 1.3-megapixel camera. It’s running Android’s Ice Cream Sandwich operating system — not the latest flavor of Android — and a feature called the QSlide lets users work in two screens at the same time. It’s unclear whether the phone will be upgradable to Android Jelly Bean 4.1, Google’s newest OS. The LG Optimus G goes on sale in Korea next week, and will launch in other “key global markets” in October. 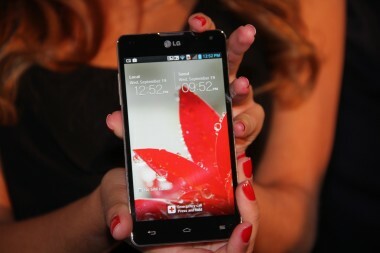 It will come to the U.S. in the fourth quarter of this year, LG said today. LG didn’t announce which carriers will offer the Optimus G or how it will be priced, but it’s safe to say, since this is a flagship phone, it won’t be priced in line with budget phones. It definitely won’t be free, as confirmed by an LG spokesperson. The model LG showcased today has 32 gigabytes of storage and is supposed to toggle between 3G and LTE or HSPA+ high-speed networks with minimal impact on battery life, due to its quad-core processor. 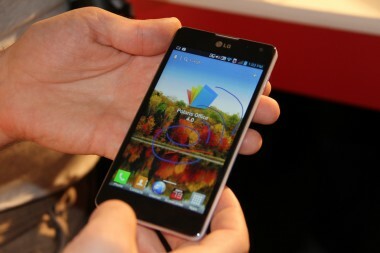 But the question for LG isn’t necessarily whether this is a good phone; it’s how LG plans to market this phone in an increasingly crowded Android market, with a handful of formidable smartphone competitors hitting stores this fall, including Nokia’s new Lumia phones, the Samsung Galaxy S III and — oh, yes — the iPhone 5. In April, the company launched the Sprint-offered, family-friendly, $99 LTE Viper phone, first announced at CES this past January. In a recent comScore report on the U.S. mobile market, Samsung led the handset manufacturing market with a 25.6 percent share. LG followed with an 18.8 percent share, down half a point, and Apple came in third with a 15.4 percent share, edging up 1.4 points from a previous report.